The mission of the Macau Science Center is to promote science popularisation and education among local adolescents, to establish a new landmark to complement tourism development in Macau, and to provide a regional platform for science education, convention and exhibition. 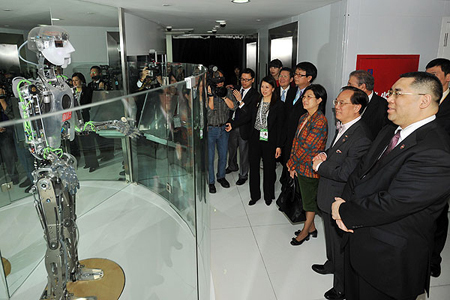 Jack the RoboThespian started his career in the Macau Pavilion at the Shanghai Expo. Speaking in Mandarin, Cantonese and Portuguese, Jack impressed the audience with his wide knowledge of the culture, economy and general life in Macau. Since the ending of the exhibition, Jack has taken up permanent residence in the Macau Science Center, featured as part of their Gallery of Robots and educating visitors on all manner of scientific endeavour.